KATHMANDU, NEPAL — Seven people, including South Korean climbers, were killed and two more are missing on Gurja Himal mountain after a strong storm swept through their base camp, Nepalese police said Saturday. A storm destroyed their camp Friday evening, and two rescue helicopters were unable to land because of bad weather conditions on the mountain Saturday, police said. Villagers who reached base camp Saturday afternoon found the bodies of four South Korean climbers, two Nepalese guides and another person yet to be identified, while the search was continuing for two more, police official Bir Bahadur Budamagar said. There were five South Korean climbers and four Nepalese guides in the camp when the strong storm hit. "The camp was completely destroyed," Myagdi district official Liladhar Adhikari told BBC News. 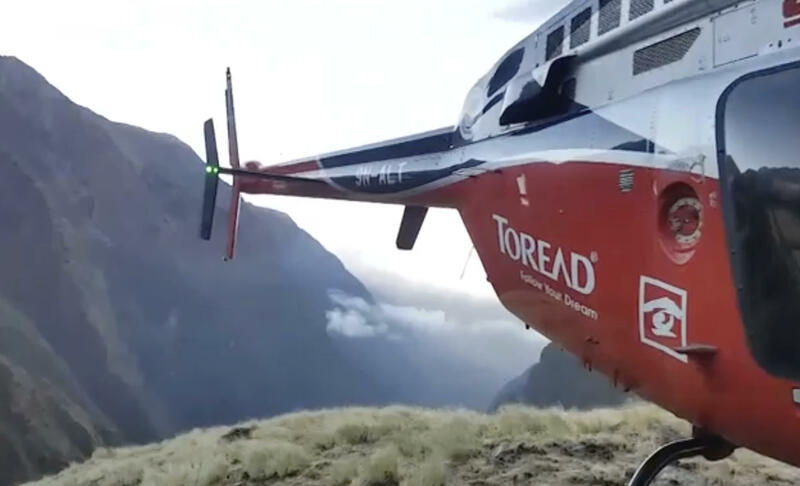 "[A recovery team] could see the bodies of the climbers scattered near the camp." It was unlikely the weather would clear on Saturday and helicopter flights were likely to be possible only on Sunday. A police team was heading toward the base camp on foot and will likely reach there on Sunday, Budamagar said. The climbers were attempting to scale the 23,590-foot peak during the autumn climbing season.